This is Opacity Zero, a show about challenging the unknown with curiosity. I am Melanie Heymans and it’s my pleasure to welcome you to today’s episode about a quite unusual day. On this day in 1817 the New York Stock Exchange was founded. On this day in 1887 the telescopic fishing rod was patented. On this day in 1985 the IRS reported that more than four hundred thousand Americans are millionaires. On this day in 2014 a Boeing 777 with 239 passengers and crew on board disappeared over the South China Sea without a trace – the day is…March 8th. If you look up at any given time, day or night, there are between 8000 and 13,000 planes, carrying more than 300,000, in the skies above you. Every day more than 100,000 flights depart from airports all over the world which leads to a stunning number of more than 36 million flights a year. Now keeping these numbers in mind, how many times have you heard that one of these millions of flights has disappeared without a trace in let’s say the past 10 years? Well, if you have heard about every single one of them it would be exactly 4. 4 aircraft disappeared without a trace in the past 10 years – one was a cargo flight from the Ivory Coast to Namibia, another one an aerial survey aircraft in Guyana, the third one was stolen from an airport in Angola, and the last one was Malaysia Airlines Flight 370, a scheduled international passenger flight from Kuala Lumpur International Airport to Beijing Captial Airport in China. While you might not have heard about the first three vanished aircraft chances are pretty good that one way or another you have heard about the disappearance of MH370. At first neither authorities nor the media called it a disappearance – in their first statement, on the morning of March 8th 2014, Malaysia Airlines simply stated that Air Traffic Control had lost contact with MH370 a few hours earlier, and that they were focusing all their resources on locating the plane as soon as possible. The first headlines followed suit “Malaysia Airlines loses contact with Jet Carrying over 200” headlined the New York Times, “Malaysia Airlines Jet goes missing with 239 on board” reported the Wall Street Journal, “Missing Flight MH370” scrolled over the news ticker at the BBC. Hours, days and weeks passed by, and despite a massive international search no sign of MH370 and its 239 passengers and crew on board was found. Slowly the headlines changed from “rescue” to “recovery”, “missing” turned into “probably crashed” while “hope” turned into “anger and despair”. How could a Boeing triple seven, operated by a prestigious FAA-certified airline, with a stellar safety record, and flown by one of its most experienced pilots disappear without a trace? How could a routine red-eye flight turn into the greatest aviation mystery of all time? On the evening of March 7th 2014 MH370 is scheduled to depart Kuala Lumpur International Airport shortly past midnight, at 12:35am. The aircraft, a Boeing triple seven two hundred has arrived earlier that day, shortly after 3pm, from Beijing Capital Airport and is now waiting at the gate for the crew and passengers of MH370 to board. The US-made widebody aircraft is remarkably safe to fly – as of March 8th 2014 its safety record shows 11 aviation accidents resulting in 3 fatalities. Since the delivery of the first Boeing 777 in 1995 its safety statistics have continuously placed it in the top 5 safest aircraft of all time. The triple seven scheduled to complete the flight from Kuala Lumpur to Beijing in the early hours of March 8th, 2014, was delivered to Malaysia Airlines in early 2002. With 12 service years the aircraft falls right into the average age range of the worldwide air transport jet fleet. The last maintenance check for the aircraft was carried out on February 23rd 2014 – just 12 days earlier. Sometime in the hours between 3pm and midnight of March 7th 2014, maintenance engineers of Malaysia Airlines also conduct a routine stay-over check. During that check the engineers complete a few service requests and replenish the crew oxygen system due to a decay in pressure. While maintenance, cleaning, and engineering crews are getting the aircraft ready for its next departure, passengers and crew start checking in at Kuala Lumpur airport. The Captain of MH370, Zaharie Bin Ahmad Shah signs in for duty at 10:50pm that night, roughly 25 minutes before the First Officer, Fariq Bin Abdul Hamid. Both pilots are recorded shortly after by video surveillance walking through a brief security check together. Captain Zaharie joined Malaysia Airlines as a cadet pilot in 1981. In the 33 years since then he has accumulated more than 18000 flight hours. I did the math to get a bit of a better feeling for what that really means and 18000 hours of flight are the equivalent of flying a plane for 2 and a half years straight…non-stop…24-hours a day. And he spent almost half of this time, half of these 2 and a half years, flying the type of plane he is flying in the early hours of March 8th, the Boeing seven-seven-seven. So it comes as no surprise that Captain Zaharie’s family, friends and peers describe him as a highly experienced pilot who is deeply passionate about flying and loves to share his passion with others. In fact Captain Zaharie is an instructor and examiner on the Boeing triple seven fleet as well as an authorized examiner for the Department of Civil Aviation in Malaysia. MH370’s First Officer, Fariq Bin Abdul Hamid, joined Malaysia Airlines as a cadet pilot in 2007. In the 7 years since then he has accumulated about 2800 hours of Flight – that’s the equivalent of almost 4 months of continuous flying. First Officer Fariq, who was only recently promoted to the Boeing 777 fleet has clocked a little over 39 flight hours on this type. . . MH370 is to be his final training flight. Along with Captain Zaharie and First Officer Fariq the 10 members of the cabin crew – each with 13 to 35 years of experience – are making their way toward the aircraft. After the 12 crew members reach the plane the cabin crew starts preparing for the soon to arrive passengers while the ground crew is loading the aircraft’s cargo and the flight crew begins their pre-flight checks. Captain Zaharie orders 108000 pounds of fuel, more than enough to take the triple seven and its passengers 2830 miles north east to Beijing Capital Airport. The 5 and a half hour flight will require about 82000 pounds of fuel, which leaves the aircraft with a reserve of about 26000 pounds or 2 hours of additional flying time in case of a diversion or delay upon landing. Around midnight the passengers of MH370 are asked to start boarding. As the passengers step into the aircraft and get settled Captain Zaharie and First Officer Fariq are getting ready for push back from the gate. At 12:25am the First Officer contacts Airway Clearance Delivery to confirm details of the flight plan and request clearance to Beijing. MH370 is cleared and radio communication is handed over to Lumpur Ground Control at 12:26am. After all 227 passengers are seated with their seat belts fastened, their on-board luggage safely stowed away in the overhead bins above them or under their seat, the doors of the aircraft closed and cross checked, First Officer Fariq requests push and start from Ground Control – Lumpur Ground approves the request and MH370 pushes back at 12:27am. At 12:32am First Officer Fariq requests and is cleared to taxi to runway 32R. At 12:40am MH370 is cleared for take-off and about a minute later, at 12:41am MH370 takes off into the night skies of Kuala Lumpur. On board the climbing triple seven are 239 people – 12 crew and 227 passengers from 14 different nations. Amongst them are business and leisure travelers alike, artists, salespeople and engineers, newlyweds, children, grandparents, couples, single travelers, families and friends, and two asylum seekers traveling with stolen passports. In the underbelly of the aircraft are 31517 pounds of cargo – passenger luggage, books, mangosteens – yeah I had to look that one up too, it’s the fruit of a tropical evergreen tree – documents, electric parts – and five and a half thousand pounds in Lithium Ion batteries and walkie talkie accessories. Shortly after take-off, at 12:42am, MH370 is cleared to climb to flight level 180 – which indicates 18000 feet – by Kuala Lumpur Air Traffic Control, and instructed to fly directly to waypoint IGARI – waypoints are geographic locations used to help pilots navigate along established air corridors. As MH370 is approaching the border between Malaysian and Vietnamese Airspace, Kuala Lumpur Air Traffic Control contacts its Vietnamese equivalent Ho Chi Minh Air Traffic Control at 12:43am to communicate the expected time of arrival of MH370 at IGARI as 1:22am. At 12:46am MH370 is cleared to climb to flight level 250 – yes that’s 25 thousand feet – and four minutes later to flight level 350, its cruising altitude. At 01:01am Captain Zaharie reports that MH370 is maintaining Flight level 350. About 6 minutes later, at 01:07am, the Aircraft Communication and Reporting System ACARS – which manages flight plan and maintenance data between the aircraft and the Malaysian Airlines Operations Center – sends its first routine position report to the ground indicating that the aircraft is flying smoothly at 35000feet. This system is programmed to send updates every 30 minutes however this message is the only ACARS report MH370 will send that night. Shortly after the ACARS message is transmitted Captain Zaharie again reports that MH370 is maintaining Flight Level 350. About a minute later, at 1:20am, MH370 passes over waypoint IGARI before its radar label, identifying the aircraft and indicating its actual and assigned altitude, suddenly disappears from the radar screen at both Kuala Lumpur and Ho Chi Minh Air Traffic Control. Exactly 37 seconds later MH370s radar position symbol disappears from the radar screens as well – at 1:21am on March 8th 2014 Air Traffic Control has lost all radar contact with MH370. After the last radar returns disappear from civilian radars Malaysian Military Radar, which uses different systems, continues to track MH370 as it starts to deviate from its planned flight route. Now let’s keep in mind that military radar information isn’t available to air traffic controllers at the time of the incident, and won’t be published for weeks after, so they don’t know that Air Defense radar systems show MH370 turning right but almost immediately making a sharp left turn to a south westerly direction. MH370 is now flying back towards the Malay Peninsula. If you would like a visual of the current flight path of MH370, and are not driving or operating any machinery, take your right hand and hold it up right in front of you – palm facing towards you, fingers spread apart. Now imagine that the plane took off at the lower left corner of your hand – where the outside of your palm meets your wrist, that’s Kuala Lumpur right there. From there it flies in a pretty much straight line towards the base of your index finger also known as waypoint IGARI. On any other day MH370 would now continue to fly straight on, all the way up to the tip of your index finger, where it would land in Beijing. But not on March 8th 2014, instead of flying straight on after passing over IGARI MH370 deviates from its original flight plan, makes a slight right turn at first, but then turns 180 degrees to the left and starts to fly in a straight line towards the base of your pinkie or the Island of Penang. Over the next 18 minutes MH370 is heading southwest – towards the base of your pinkie – at fluctuating ground speed between 568 and 608 miles per hour and altitudes between thirty one and thirty three thousand feet. During this time Ho Chi Minh Air Traffic Control, which MH370 was expected to check in with at waypoint IGARI, is trying to reach the aircraft but after several failed attempts reaches out to Kuala Lumpur Air Traffic Control to see if they are in contact with the aircraft. Kuala Lumpur Air Traffic control reports that they haven’t heard from the plane since it signed off with “Good night Malaysian 370” 20 minutes earlier. Based on Ho Chi Minh’s inquiry Kuala Lumpur tries to contact MH370 at 1:41am but does not receive any response. 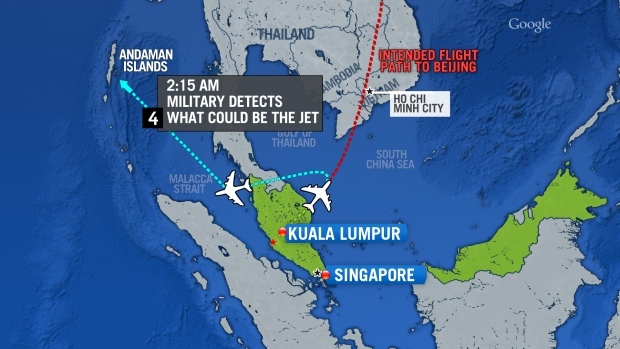 Between 1:41am and 1:50am Air Traffic control in Kuala Lumpur and Ho Chi Minh contact each other several times to exchange information about when and where they had last radar and/or radio contact with MH370. During these conversations Ho Chi Minh reports that even though they maintained radar contact with MH370 till 1:21am – when the radar blip disappeared – no verbal contact was ever established with the aircraft. While the two Air Traffic Controllers are trying to locate MH370 with the help of nearby aircrafts, the Malaysian Airlines Operation Center, and the Air Traffic Control Centers of nearby sectors, they are unaware that the Malaysian air defense radar systems at Butterworth airbase capture MH370 flying slightly south of the Island of Penang – in our hand map the base of our pinkies – at 1:52am. About 10 minutes later, at 2:02am, the same radar shows MH370 heading towards Pulau Perak, a small island in the Straits of Malacca. On our hand map the plane is now flying from the base of your pinkie towards the tip of it. Remember, it’s original destination was Beijing, at the tip of your index finger. At 2:22am MH370 is observed heading towards waypoint MEKAR, over the Andaman Sea, but disappears abruptly, at the tip of your pinkie, when leaving the range of Malaysian Military radar about 230 miles northwest of the Island of Penang. Now this is where it gets really tricky because at this point all radio communication and radar information about MH370 is lost. With no verbal or visual contact, no distress signal and after flying for over an hour since the last contact no one knows what’s going on aboard the aircraft. After all radio and radar communication is lost there is only one communication system left on the Boeing triple seven – satellite communication or SATCOM. As the name indicates this is acommunication system that utilizes satellites to transmit information between an aircraft and a ground station. The system installed on this aircraft uses the Inmarsat Classic Aero System and provides several voice and data channels for text and audio communication, ACARS data transmissions and In-Flight entertainment equipment connectivity. You can imagine SATCOM and Inmarsat a bit like your cell phone and your network provider – they just provide the infrastructure for you to make calls, surf the web and send emails and texts, they are generally not actively using your phone, you are. After 2:22am MH370 and the Inmarsat Ground Station, in Perth Australia, complete 7 of these handshakes over the next 6 hours. The first one, at 2:25am, only three minutes after MH370 disappears from military radar over the Andaman sea, is another Log-on request initiated by the aircraft. Remember, the aircraft already logged on to the system earlier that night while it was still on the ground. The following 5 handshakes, at 3:31, 4:41, 5:41, 6:41, and 8:10am are all automatically initiated by the ground station and are each answered by the aircraft. The last handshake at 8:19am is another log-on request, initiated by the aircraft. When the ground station sends its next ping message at 9:15am MH370 fails to respond. On this day – July 13th 2015 – after 16 months of the most extensive, intensive and expensive air, sea and underwater search in aviation history no sign of MH370 and the fate of its 239 passengers has been found. Many different theories have been published since the disappearance of MH370, some are possible, others are implausible, a few are flat out crazy (not to say that crazy doesn’t happen), ours will be the one that is most likely – based on what we know, about this flight, its passengers and crew, aviation and how the world works in general. So join us over the next few weeks as we explore catastrophic failure, human error, and acts of sabotage as the possible cause of the disappearance of MH370, leading us all the way to what most likely made a Boeing triple seven and its 239 passengers disappear on March 8th 2014.